Parishioners at an Ottawa church bid farewell to their house of worship Sunday as they prepare to merge with another Anglican congregation. St. Matthias Anglican Church on Parkdale Avenue is closing as declining attendance numbers are forcing parishioners to join All Saints' Anglican Church in Westboro. "It's sad that many of us are going to be parting company. We don't like it, but it's come upon us. We can't do anything about it," said Deirdre Piper, who's been the music director at St. Matthias for the past 25 years. While about 200 people attended Sunday's service, the congregation's size has dipped to around 75 people in recent years, said parish priest John Wilker-Blakley. "We aren't out of money, but we didn't want to see that money going into bricks and mortar," Blakley said. "We wanted to see it used to support real ministry with real people." 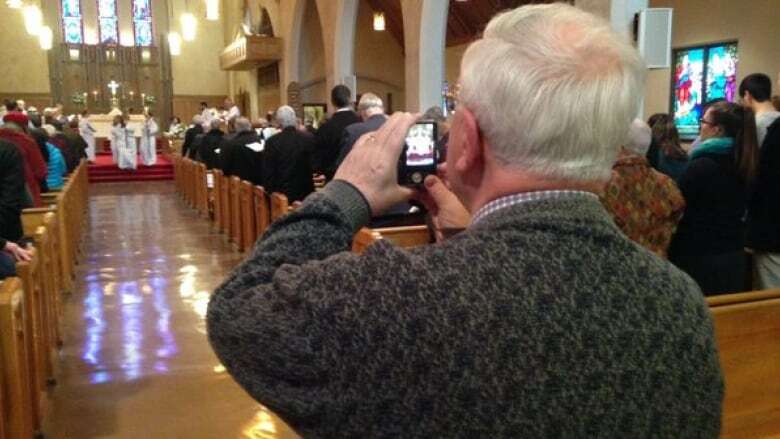 The CBC's Robyn Miller took in the final service at St. Matthias. St. Matthias held its first service in 1887 — not in the grey brick church just south of the Queensway, but in the dining room of a former hotel on Wellington Street in the city's Hintonburg neighbourhood. The congregation laid the cornerstone of the current building in 1939. The church is expected to be deconsecrated in March.